The feel-good ABBA jukebox musical begins its run Friday on Mother’s Day weekend. (Francisco Kjolseth | The Salt Lake Tribune) Sovay Shenefelt, 3, jumps for joy as she is shown a costume piece with her favorite colors of purple and pink for the upcoming show of Mamma Mia! at Pioneer Theatre. The cast and crew have spent years juggling schedules to balance mothering and professional work, including Sovay's mother and actor Megan Shenefelt, actor Mary Fanning Driggs, director/choreographer Patricia Wilcox and costume designer Brenda Van der Wiel, from left. (Francisco Kjolseth | The Salt Lake Tribune) Cast and crew members of the musical Mamma Mia! at Pioneer Theatre maintain rich parallels to themes of the musical having spent years juggling schedules to balance mothering and professional work. Actor Mary Fanning Driggs, who has six kids, costume designer Brenda Van der Wiel, single mom of two, Megan Shenefelt with daughter Sovay, 3, and New York based director/choreographer Patricia Wilcox, mother of two, from left, have extensive stories of making it work. (Francisco Kjolseth | The Salt Lake Tribune) New-York based director/choreographer Patricia Wilcox surveys the scene in the costume room at Pioneer Theatre for the upcoming musical Mamma Mia! Wilcox, like many of the other moms with a career in theater, juggles the rigors which which will mean missing opening night to make it back to New York for her younger son's university graduation ceremonies. (Francisco Kjolseth | The Salt Lake Tribune) Cast members of the musical Mamma Mia! geek out over one of the purple bell bottom pants scheduled to be worn by actor Mary Fanning Driggs, left, as she is joined by director/choreographer Patricia Wilcox, costume designer Brenda Van der Wiel and actor Megan Shenefelt holding her daughter Sovay, 3, in the costume shop at Pioneer Theatre. (Francisco Kjolseth | The Salt Lake Tribune) Utah actor Megan Shenefelt, left, is joined by her daughter Sovay, 3, as as she expresses interest in rack covered with different types of belts used in shows, including the upcoming musical Mamma Mia! at Pioneer Theatre. (Francisco Kjolseth | The Salt Lake Tribune) Actor Megan Shenefelt finds approval from her daughter Sovay, 3, in part of her costume for the upcoming musical Mamma Mia! as cast and crew prepare for the run at Pioneer Theatre. (Francisco Kjolseth | The Salt Lake Tribune) It's all about the shoes as costume designer Brenda Van der Wiel breaks out the sparkly high platform shoes being worn by the cast of the upcoming musical Mamma Mia! at Pioneer Theatre. The three, including Actor Mary Fanning Driggs, center, and New York based director/choreographer Patricia Wilcox join moms everywhere, juggling theater lives and kids on an off the stage for years. (Francisco Kjolseth | The Salt Lake Tribune) Utah actor Megan Shenefelt, left, is joined by her daughter Sovay, 3, as they talk about the costumes with director/choreographer Patricia Wilcox for the upcoming musical Mamma Mia! at Pioneer Theatre. (Francisco Kjolseth | The Salt Lake Tribune) Patricia Wilcox, left, director/choreographer of Pioneer Theater's upcoming musical Mamma Mia! is joined by costume designer Brenda Van der Wiel in the costume shop during a recent fitting. The cast and crew have spent years juggling schedules to balance mothering and professional work. (Francisco Kjolseth | The Salt Lake Tribune) Actor Megan Shenefelt is joined by her daughter Sovay, 3, as they explore the halls of Pioneer Theatre where cast and crew assemble costumes and fit actors for the upcoming musical Mamma Mia! (Courtesy photo) Mary Fanning Driggs (Rosie), left, Coleen Sexton (Donna) and Amy Bodnar (Tanya) perform in Pioneer Theatre Company's production of Mamma Mia! (Courtesy photo) Brian Sutherland (Sam), left, Paul Castree (Harry) and Dan Sharkey (Bill) perform in Pioneer Theatre Company's production of Mamma Mia! (Courtesy photo) Coleen Sexton (Donna) and Kathryn Brunner (Sophie) perform in Pioneer Theatre Company's production of Mamma Mia! (Courtesy photo) Aidan Wharton (Sky) and Kathryn Brunner (Sophie) perform in Pioneer Theatre Company's production of Mamma Mia! (Courtesy photo) Coleen Sexton plays Donna in Pioneer Theatre Company's production of Mamma Mia! (Courtesy Pioneer Theatre Company) Coleen Sexton (Donna Sheridan) and Kathryn Brunner (Sophie Sheridan) star in the upcoming production of Mamma Mia! Sure, the disco generation might have grown up with ABBA hits, but quieter ballads from the jukebox musical “Mamma Mia!” are striking poignant notes for the mothers in the cast of Pioneer Theatre Company’s new production opening next week. As ABBA fans know, the jukebox musical centers on Donna (Coleen Sexton), a middle-aged single mother, as her best friends help her prepare for her daughter’s wedding. Sophie, (Kathryn Brunner), her free-spirited daughter, invites three of Donna’s former boyfriends to attend, hoping to find her father and invite him to walk down the aisle. In rehearsal, those lyrics offer rich parallels for New York-based director/choreographer Patricia Wilcox and Utah actor Mary Fanning Driggs, as two of their children are preparing for college graduations. And then you’re preparing to let them go, whether you’re playing a middle-aged mother in a musical singing a bittersweet ballad, or a mother working in the performing arts. Like mothers everywhere, Wilcox and Driggs and other mothers at the theater company have spent years juggling schedules to balance mothering and professional work. (Francisco Kjolseth | The Salt Lake Tribune) It's all about the shoes as costume designer Brenda Van der Wiel breaks out the sparkly high platform shoes being worn by the cast of the upcoming musical "Mamma Mia!" at Pioneer Theatre. The three, including Actor Mary Fanning Driggs, center, and New York based director/choreographer Patricia Wilcox join moms everywhere, juggling theater lives and kids on an off the stage for years. For Wilcox, juggling means leaving Pioneer Theatre Company after the last “Mamma Mia!” dress rehearsal — missing opening night — to make it back to New York for her younger son’s university graduation ceremonies. For Driggs, who plays Rosie, one of Donna’s best friends, juggling means she’ll miss her daughter’s graduation ceremonies from the culinary program at Utah Valley University. Plenty of other family members will be there, and her daughter has told Driggs she’s fine with that choice. An actor works when other people are off, Driggs has told her kids over the years, which means their mother has missed many holiday events and family parties. For artistic director Karen Azenberg, juggling means scheduling Pioneer Theatre Company’s shows around her two children’s university schedules. She remembers the early years, too, when she was chasing toddlers in airports and hotel rooms. “Think toilet paper unrolled endlessly,” she says. She remembers a phase when her son, Alex (who just turned 21), was a toddler. She was working in Minneapolis in December, and her young son took the opportunity to toss socks and shoes out of his stroller as she carted him to childcare on her way to rehearsal. Azenberg also recalls claiming the maestro’s dressing room for a nanny and her then-baby daughter, Emelia (now 17), while she was directing “West Side Story” at the Virginia Opera. The borrowed dressing room became the place where Azenberg could breastfeed during rehearsal breaks. At 12 months, her son had already tap danced with Carol Lawrence, who originated the role of Maria in “West Side Story.” By age 10, Alex had traveled to more than a dozen states with Azenberg for work. For her kids, a crazy schedule based around rehearsals and opening nights seemed normal. “They probably wouldn’t have known what to do with two parents at home every night,” she says, as their father is a professional stage manager. On the other hand, a more flexible daytime schedule made Azenberg a great candidate to volunteer for elementary school field trips. Like Azenberg, Wilcox says out-of-town jobs offered the opportunity to take her two sons on the road before they entered school. As they got older, she and her husband, Broadway actor John Schiappa, juggled jobs so that one parent was always at home in New York City. “Our balance was to give them as much of a home base and a schedule as we could,” she says. As a theater mother, Wilcox says she relied on the mute button on her phone during work conference calls when she was tending her boys. “I kept them as quiet as I could, and then I would say what I would have to say, and then the mute button would go on,” she says with a laugh. As a theater mother, Driggs jokes in a phone interview, she relies on a Roomba vacuum. In one story to mark her juggling years, Driggs remembers racing home from Pioneer Theatre on her dinner break. On her way, she stopped to buy four or five replacement pacifiers for a fussy baby. At home, she started dinner, then escorted an older daughter to her violin lesson. As she rushed back to rehearsal, she laughed about what she didn’t have time to fit in: sitting down to eat herself. Driggs says her husband jokes that she has to assign five people to fill in for her when she is off performing. This week, for example, while she is in “Mamma Mia!” rehearsals, she has to call home to remind someone to take the Salt Lake County Zoo, Arts and Parks sign to her daughter’s orchestra concert. For Utah actor Megan Shenefelt, juggling means scheduling around her husband’s job or arranging a place to drop off her 3½-year-old daughter, Sovay, with her mother. “A chain of mothers” is how Shenefelt imagines it. (Francisco Kjolseth | The Salt Lake Tribune) Actor Megan Shenefelt finds approval from her daughter Sovay, 3, in part of her costume for the upcoming musical "Mamma Mia!" as cast and crew prepare for the run at Pioneer Theatre. Shenefelt, a 2015 University of Utah graduate, grew up dancing to ABBA songs, as her mother and aunt loved the musical. As a teenager, she saw “Mamma Mia!” on Broadway on one of her first trips to New York City. Back then, she thought of the show as a party. Now that she’s a mother and performing in the ensemble for this production, Shenefelt appreciates how the story depicts the unbreakable bond between a mother and her daughter. That relationship is something of an unusual focus for a musical. “Mamma Mia!” celebrates women of a certain age, while the ABBA songs seem to appeal across generations, the director says. A rich and fulfilling life, that is, that might require the kind of juggling that theater moms and moms everywhere have been doing on and offstage for years. Pioneer Theatre Company produces “Mamma Mia!,” the feel-good ABBA jukebox musical set on a sun-washed Greek island. 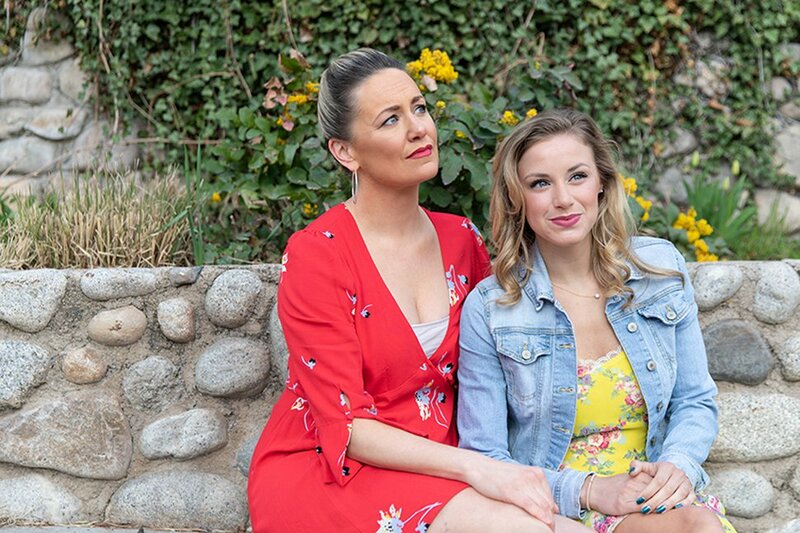 (Courtesy Pioneer Theatre Company) Coleen Sexton (Donna Sheridan) and Kathryn Brunner (Sophie Sheridan) star in the upcoming production of "Mamma Mia!"